Information for High Net Worth Divorce in Orange County & Los Angeles, California. Every divorce is unique. Every couple is different, and just because they can agree on one aspect of divorce does not mean that setting the terms of the divorce is going to be an easy task. A high asset divorce, as the name suggests, is one in which the couple, or at least one party, has a lot of property or other assets. The division of property is one of the major aspects of divorce in California, and in some cases, it can be the biggest point of contention. Depending on how the assets are divided, spousal support may also be a point of contention in a high asset divorce. It may also be necessary to acquire additional assistance from professionals in on top of hiring divorce attorneys, and high asset divorces can take a long time to settle. Like in all divorces, a high asset divorce requires the couple to set terms of the divorce, including dividing property, determining spousal and child support, and deciding on a child custody and visitation agreement. To an extent, determining things like spousal support and dividing your property when you divorce can depend on the way that your finances were maintained during your marriage. Often, those in a high asset divorce own a business or have complicated finances, which can also lead to an extra-complicated division of property. How is a High Asset Divorce Different from the Average Divorce? Those who are considered to have a high asset divorce tend to have complex finances and a lot of assets. For example, a high asset divorcee might own a business, be a professional with specific licensing, have a lot of investments, be involved in international business deals or store assets overseas, have large retirement funds, own a home or more than one home, own other property, or have entered the marriage with a lot of money or a prenuptial agreement. When two parties divorce, one party might feel that they are entitled to more of the property than the other party, or, one party might feel that they are entitled to a large sum or to spousal support while the other party disagrees. The difficulty in dividing property lies in the categorization of all property as either community property or separate property. It is illegal for either party to hide assets, and failing to disclose assets can lead to huge financial consequences, as well as potential jail time. In California, all community property is divided equitably between the parties. 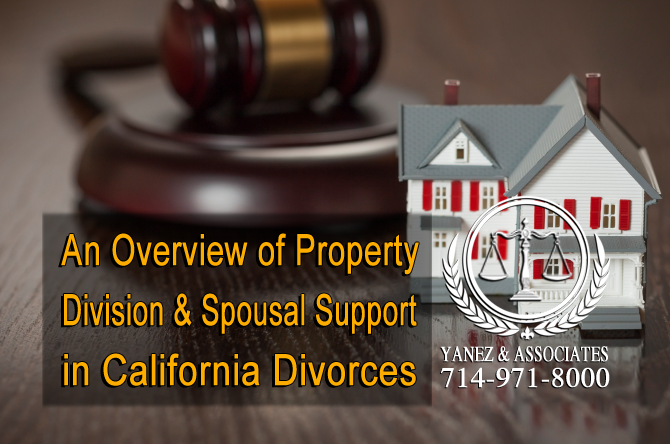 How will your Divorce in California affect your Property Division and Spousal Support Rights? In California, when dividing property in a divorce, property and debts are categorized into two parts: community property and separate property. Upon divorce, community property is divided equitably between the spouses or partners, and separate property already belongs to one spouse or the other. Categorizing property as either community property or separate property can be a challenge, especially in high asset divorces. As a general rule, the following definitions apply. Separate Property - Anything acquired prior to the marriage or registration of the domestic partnership, or anything acquired after a separation is considered separate property. Anything inherited or gifted to one party at any time before, during, or after a marriage or registered domestic partnership is also considered separate property, as well as anything earned from selling or investing anything from prior to the marriage or domestic partnership, or from selling or investing any gifts or inheritances. Community Property - Any debts or property acquired during a marriage or registered domestic partnership is considered community property. This includes the income of both parties, furniture, credit card debts, homes, businesses, etc. It excludes gifts or inheritances, and anything earned from the sale or investment of gifts or inheritances. The longer a couple has been married, and the more intertwined their finances are the more complex the categorization of property and debts can be. Commingling, or the mixing of community and separate property is common, especially in longer marriages. Tracing is a process that can be used to determine the origin of certain property, but it can be complex and may not always be useful. Spousal support in California is determined based on a standard calculation, but it can be different in every marriage. It depends on several things including the following. • Potential impact of taxes on either spouse paying or receiving spousal support. Both parties’ financial situation following a marriage also depends on the division of property. The assets and debts that both parties have acquired during the marriage also have an affect on their established standard of living. Therefore, your attorney and the way that your property and debts are divided will likely have an affect on your spousal support determination. How Can A High Asset Divorce Attorney Help in My Divorce? If you own a Business or you're a Licensed Professional or have significant assets you need to consult a High Asset Divorce Attorney to know your rights! Hiring a divorce lawyer who has experience working on high asset divorces in California can put you a step ahead, whether you are trying to ensure that you get a fair deal, or you are looking to protect your personal assets from being divided with your spouse or partner in a divorce. Many aspects of your finances need careful consideration in order to be fairly and equitably divided. Owning a business can be very rewarding. In some divorces, one spouse or partner owns a business on his or her own. Sometimes the divorcing parties run a business together. Sometimes one or both partners own a business with other business owners, either individuals or other couples. If you own a business, it is important to hire an attorney who has experience in high asset divorces, because the future of your business may depend on it. Sometimes, one party will buy the other out of the business. Sometimes, the parties will sell the business together and split the funds. Regardless of how the business ends up being handled in the divorce, it is important that it is appropriately valued. Working with an attorney who has experience with this kind of divorce means that your attorney has a working relationship with professionals and experts in the field who can help you ensure that your business is valued and divided equitably. Business specifically can affect how your spousal support agreement works out. For example, if two spouses or partners previously ran the business together, and one partner buys the other out, one spouse will continue to have an income, while the other will be jobless. Or, if one spouse runs a business with other parties, any effort that the other spouse put into helping that spouse obtain training, education, or work will be considered when determining spousal support. What if you are a licensed professional? As a licensed professional, whether you are a dentist, a doctor, an attorney, or you have another type of license that allows you to work in your profession, it is important for you to work with a lawyer who has experience in high asset divorces. Like other business owners, your livelihood could be at stake in a divorce. Your lawyer will be able to help with things like property you own or rent for your business, including land or buildings as well as equipment, the valuation of your business practice, taxes, finances, and any insurance policies (life insurance) or retirement funds. What if you have significant investments? In addition to property and business ownership, investments can play a role in your divorce as well. Income that you have earned from investments during your marriage is eligible for equitable distribution in a California divorce. So what happens when you can’t just cash out all of your investments when you divorce? What if you simply don’t want to? What happens when you and your spouse each take different investments in a divorce, and your spouse’s investment does well while yours does poorly? Projected profits and professional evaluations may be necessary to protect your interests in your divorce. Working with a qualified lawyer will also be a great way to access experts in the field who can help you work out the details of your divorce. If you have a high asset divorce on the horizon, it is a good idea to discuss your case with a skilled lawyer who has experience in cases similar to yours. Take advantage of your free initial consultation and ask your potential divorce lawyer about his or her experience. Contact the lawyers at Yanez & Associates today to schedule your consultation. 2 How is a High Asset Divorce Different from the Average Divorce? 4 How Can A High Asset Divorce Attorney Help in My Divorce? 4.1 What if you own a business? 4.2 What if you are a licensed professional? 4.3 What if you have significant investments?